The 24.2MP Nikon D3300 DSLR F-mount camera is an impressive pick for serious entry-level photographers. When paired with one of the top compatible lenses detailed in this review, the D3300 is purely built for those who’ve discovered a genuine passion for photography. My guide reviews the best lenses for Nikon D3300 cameras. Which ones meet your needs and expectations depends on individual styles and budget. The six lenses in this guide cover a wide-range. There’s something for serious beginners to the experienced hobbyist. The latter group demands extra advanced features, specs, and performance. Nikon launched this DSLR body in January 2014. This feature-packed model provides improved tutorials and a user guide-mode. Now you can concentrate more on the photography and less on the camera. The D3300 is a camera that today’s amateurs will look back on with extreme fondness. For now, though, the priority is to get the greatest results with lenses that harmonize with this body. Prepare to discover the perfect 35mm standard prime lens. Read about the 10-24mm wide-angle and 18-35mm standard zoom picks. We’ve also got a macro, prime portrait, and wildlife/sports lens. It may surprise you to know that not all these quality optics are Nikon-branded lenses. We all want at least one prime lens in the camera bag, right? The Nikon 35mm f/1.8G is an ideal choice for the Nikon D300 digital-SLR with a fast f1.8 aperture. It’s also small and affordable. I doubt you’d find better optics than this one at the entry-level. I found the focus to be consistently fast and accurate, and that’s a great start. Sometimes we want lightweight speed for those spontaneous shots. The Nikon 35mm f/1.8G Standard Prime is a no-brainer for anyone who does a lot of handheld shooting in low light situations. A few folks moan about the absence of vibration reduction but you really don’t need it with this puppy. This is what I call an everyday lens—the one to keep on the camera ready for action. But this is just my opinion. Let’s see what other users have to say about it. You only need to see the number of uploaded photos to know what reviewers think of this lens. Some say it sets them free. Others talk about how it’s the perfect lens for lazy photographers. Beautiful photos, amazing bokeh, great build, and flexibility are all common compliments. 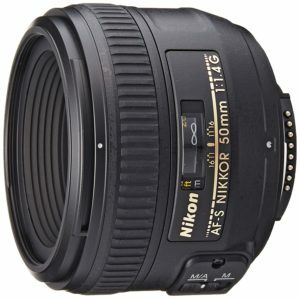 The Nikon 35mm f/1.8G is a good seller for good reasons and the feedback is over 90% favorable. It’s a great all-around lens, but most people love it for street photography and portraiture. Being light and simple makes it a particular favorite with novice shutterbugs. The only real complaints are the absence of vibration reduction (VR) and the plasticky feel. Still, VR is not so important with a small fast lens, and the quality plastics are what keep it light. The few gripes that reviewers write about are very minor. Nothing I came across seemed enough to deter folks from buying this high-quality product, though. Not all lenses are equal in weight-to-focal-range ratio. But at just seven ounces you won’t find the weight of this Nikon 35mm standard prime on any cons lists. Image quality is another high point as you’d expect with Nikon prime optics. Tack sharp is something of a cliché in photography jargon, but it’s fitting in this case. Low-light shooting is also possible thanks to the fast f1.8 aperture and its lightweight. This is reassuring for opportunists who like to take candid shots in all situations. The rear focusing is handy. It means only the rear lens elements move so there’s no front rotation. That’s useful when using screw-on filters like polarizers or a star-burst, as two examples. And if it’s bokeh you want, this beauty doesn’t disappoint. There’s not much to complain about with this lens. The few gripes there are will not affect the buying decisions for most photographers. Some new users complain that there’s no vibration reduction (VR). Though, with a lens of this weight & speed, you get fast shutters speeds even in low light, so VR is not so important. VR is invaluable with heavier, slower lenses, but it’s not missed with the Nikon 35mm f/1.8. Those who complain will realize this once they get comfortable shooting with this beauty. Some folks comment about the disadvantage of the fixed focal length. It means more legwork to compose shots. Well, if a zoom function is imperative, buy a zoom instead—problem solved. The flaws people find are not faults, per se, but observations. There’s very little to criticize here. My next choice for the Nikon D3300 is Sigma’s 18-35mm F1.8 wide-angle to standard zoom. This is from the ARTisan series for Nikon, and is a match made in heaven. It’s not cheap but it is exceptional. The lens has a fast f1.8 aperture and an equivalent 28-55mm range. The bright aperture makes this another good choice for handheld shooting in low light. That’s something most photographers value. Anyone who follows my lens reviews knows that I’m a big fan of bokeh. This chunk of quality class delivers a beautiful bokeh effect thanks to the wide aperture and 9-blade rounded diaphragm. I also like the lens’ compatibility with Sigma’s unique USB Dock. What this does is allow you to fine-tune the focus. It can also update the lens’ firmware via SIGMA Optimization Pro when necessary. 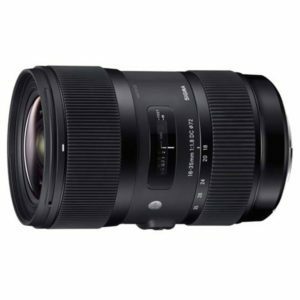 The Sigma 18-35mm F1.8 Art lens sells well. Sales figures and star ratings are often all some new buyers look for. 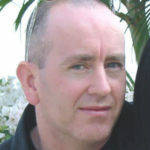 Others like to get more in-depth to see if the product meets all their needs. Many reviewers make a point of praising the lens’ ability in low light situations. They’re right, too. A wide aperture means faster shutter speeds, which is what you need for handheld photography. Other things reviewers compliment are image quality, price, build, fast focus, and silent AF. Some are unhappy with the weight and bulk of the lens, though. How it feels probably depends on the camera. The majority of photographers who write reviews are happy with their purchase. There are plenty of images uploaded to back up their comments, and that’s always welcome for buyers on the fence. The build of a lens is always an important consideration. It’s even more of an issue if you plan to keep it for many years. The Sigma F1.8 Art 18-35mm is not only well-built, it also feels nice in the hand. The solid construction adds to the weight but it’s a sacrifice people seem happy to make. The lens also gets a lot of positive response for its image quality, contrast, and tack sharpness. Weight aside, this is still a versatile lens that sits well on the Nikon D3300. It provides a wide aperture at wide angle and its moderate zoom capability is perfect for short range photography. The amazing bokeh and fast autofocus are two more quality features that make this lens stand out. There’s also internal focusing (IF), and the lens’ video production capability to boot. Sigma’s F1.8 Art 18-35mm really is the perfect all-rounder that any photographer could find uses for. Portraits, landscapes, close-ups, still life, and casual street photography – it suits all. 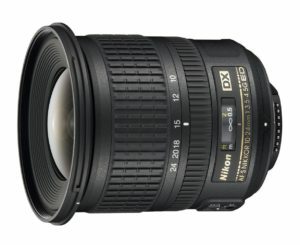 The main disappointment with the Sigma F1.8 Art 18-35mm is no vibration reduction (VR). It’s not such an issue with smaller, lightweight lenses, but VR would be welcome with this 29 oz. zoom. Another issue is that the Hyper Sonic Motor (HSM) is noisy. It delivers fast, accurate & smooth autofocus, but… it lets you know when it’s working. It’s supposed to be quieter than other AF motor systems. The noisy HSM interferes with the camera’s built-in mic, too. If you want to shoot video you’ll be better off using an external mic. Another minus is the size of the lens hood as it makes storing the lens awkward. You may have to take it off and put it on each time you use the lens. The hood also gets in the way when fitting the lens cap. I wanted to add a quality ultra-wide-angle zoom here for enthusiastic landscape photographers. I think I found it with the Nikon AF-S DX NIKKOR 10-24mm f/3.5-4.5G ED. This is a good choice of wide-angle for all sorts of reasons, but not least because you can use filters on it. And the internal focus means you won’t mess up those sensitive filters if you need to refocus. As an ultra-wide zoom it’s an affordable choice for certain business users. Real estate agents and architects are a couple of prime examples of those who could benefit. The lens also sports Nikon’s Silent Wave Autofocus Motor (SWM) that’s as quiet as a whisper. The SWM is of particular benefit to photographer’s who shoot video and need quiet mechanics. There was hardly any purple fringing with this lens, not even at the wider apertures. I put this down to the success of Nikon’s extra-low dispersion glass that helps to control chromatic aberrations (CA). The glass also includes aspherical lens elements. These seem to do a great job at controlling lens flare and coma. The image quality wouldn’t be as clear at wider apertures without it. I love this lens, but will you? Most reviewers write about the lens’ versatility as one of its top attributes. It’s a good point. You’ve got an ultra-wide angle, and a more standard focal length for when you need the switch. Reviewers love the image quality overall. Some are proud to post personal photos to back up their satisfaction. These are mostly landscapes using the wider focal lengths. There’s some talk of distortion at the wider 10mm range, but that’s not uncommon with lenses in this class. It’s quite possible to correct most distortion issues using software like Photoshop. Image sharpness, nice colors, and fast focus are other common areas that users praise. There are some gripes about the price. You’ll see a few moans about the weight, too. The Nikon f/3.5-4.5G AF-S DX NIKKOR 10-24mm is a well-built lens despite its plasticky feel. The image quality across the range is really nice, too. Ultra-wide angle zooms like this are specialist lenses and take some practice to perfect. By that I mean there’s a skill to working ultimate aperture settings and composition for different photographic styles. The actual lens is quite compact for a zoom in its category despite a few complaints about the weight. Neat lenses are always welcome, but compact designs usually add to the price of quality optics. This is a popular piece of glass at the beginner through to prosumer video or still photog level. Its versatility makes it an ideal lens for landscapes and cityscapes. It’s also perfect for architecture (inside and out), and more. This lens is only versatile if that versatility fits in with your style of photography. It’s still a wide lens even at the 24mm focal length. The lens hood is a nice touch… but. Well, it can peek into every shot at the wider end, and that’s annoying. It’s not a tight fit either, and if it moves it becomes even more obstructive. The hood doesn’t seem overly protective against flare at the wider apertures, either. The final disadvantage is the price. It’s quite costly for a third-party lens, though it’s still good—but not cheap. There’s a lot to like with Nikon’s wide-angle zoom for those who can justify its range. I’ve gone with Tamron’s AF F/2.8 SP 90mm for my choice of macro lens. The company has earned an excellent reputation for affordable lenses of amazing optical quality. The internal focusing (IF) means no external movements which make it ideal for close-ups of living things. It’s almost inaudible, too. Another major appeal is the full time manual override for fine-tuning. The image quality and sharpness are amazing for a lens in its class. The lens build-quality is fine, too. Tamron got a lot of bad press in the past for cheap builds, but they’ve come a long way since then. This macro lens takes some beating considering what it offers for the money. The vibration compensation (VR), moisture resistance, and advanced coating technology all add to its value. Is it perfect? No, but then even high-end brand name lenses have their critics, right? 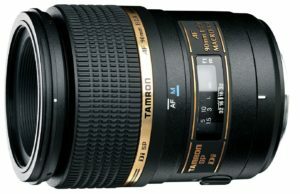 This is another solid performer from Tamron and loved by most of those who leave reviews. There are plenty of folks showing off their images too, especially of close-up shots. A picture—they say—paints a thousand words. If you want to see sharpness and bokeh, then there are plenty of great examples using this lens to view online. Many reviewers have experience with competing Nikon macro lenses, too. It’s interesting to see how they favorably compare the 90MM DI MACRO to some of those. It even fares well against Canon’s EF 100mm f/2.8L. You won’t find many reviews to put you off as far as image quality and usability goes. Tamron’s AF F/2.8 SP 90mm produces images that are clear and tack-sharp, even into the corners. The image quality throughout the range is one of the most talked about attributes. This is a well-balanced piece of glass and feels somewhat lighter than its 19 ounces on the D3300. It sports a new vibration compensation (VR) mechanism which boasts a 4-stop advantage. An anti-shake mechanism is vital to get the best out of handheld shots. I shoot most of my macro work using tripods, but not everyone does. VC is also invaluable for capturing stunning portraits in low light. Another nice touch worth a mention is the moisture resistance. The last thing you want with a lens that costs hundreds of dollars is moisture penetration. I mention this because not all lenses have it. This Tamron AF 90mm is a quality chunk of glass, but it’s not without a few faults. I’ve put the build quality down because Tamron had a reputation for poor quality builds. I highlight this point because the company has progressed a lot. The construction of their lenses is far superior compared to yesteryear. That includes this one, so try not to let past reputation deter you. The AF hunts a little at the macro end. That’s not an uncommon issue with macro lenses, especially third-party optics. Many of us prefer manual focus at the extreme close-up range anyway. Although this is a quality 90mm macro lens, it’s still quite pricey for a lot of newbies at the entry-level. The good news is that Tamron has dropped the price by a significant amount since the launch. I wanted to add a small compact prime portrait lens to this page for the Nikon D3300. I found that the Nikon f/1.4G AF-S FX NIKKOR 50mm checked all the right boxes. I’ll explain why. Anyone who’s serious about photography will want a standard prime lens in the camera bag. Well, you can’t go wrong with this classic 50mm focal length. It’s versatile and sports incredible optics. The Nikon 50mm f/1.4G weighs just 10 oz. and produces images that are tack-sharp every time. It’s a lovely piece of glass, especially for portraits and for candid low light shooting. The lightweight build and quality optics make it a great choice for everyday photography. The bokeh effect is also amazing; something that gets a lot of positive comments from users. OK, let’s see what else others have to say about it. 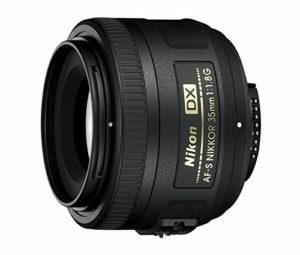 This is a popular lens and sells well among those who have the need and budget for a high-quality fast 50mm prime lens. People are not shy about expressing their thoughts, either. It’s hard to find any bad words about this lens from beginners to prosumers. The bright, sharp images, quiet AF, and superb contrast and resolution are some of the things that impress photographers. The bokeh gets lots of mention, too. It brings out adjectives like beautiful, amazing, dreamy, creamy, and gorgeous. Not all bokeh is equal, and that’s why people love to shout about it when it stands out. There are some grumbles but they really are few and far between. Not all photographers use the same cameras either, so results may differ between user experiences. There is the odd complaint about the AF speed. Another one is with the plastic build, but that also helps to reduce the weight. With a wide f1.4 aperture this lens is fast and bright. That means lots of creativity for out-of-focus backgrounds with amazing bokeh. The wide aperture also assists low-light photography. The 9-blade rounded diaphragm is no small detail either. Rounded diaphragms deliver a more natural appearance for out-of-focus elements. And it doesn’t get any better than nine rounded blades. The Nikon f/1.4G NIKKOR 50mm also sports the Nikon Silent Wave Motor or SWM. As the name suggests it enables quiet autofocus that is also super-fast and accurate. Image quality is second to none. It’s helped further with the Super Integrated Coating (SIC). What this does is improve the efficiency of light transmission and provides better colors while reducing flare. The lens feels plasticky because it’s almost all plastic. A lot of people moan about this, but a plastic build also helps to keep the lens lightweight. People never complain that a lens is too light. This particular lens has a metal mount and a hardened plastic exterior. I don’t see the problem with plastic casings if the material used is high-quality and durable. This one is. You will read some reports about the slow autofocus in low light or backlit situations. I didn’t experience any AF issues, but there’s enough talk out there to know it can be an issue for some. A lot of photographers complain about the price of this lens. A valid concern, with this option situated squarely in the upper-tier of compatible prime portrait lenses in terms of cost. My final pick for the Nikon D3300 is another quality product from Tamron, and it’s a beast. It’s a lens that appeals to folks who are into sports and wildlife photography, in particular. You don’t have to worry about mounting this puppy on your entry-level body, either. They work just great together. It’s an expensive chunk of glass, but it comes with a 6-year limited USA warranty. It’s a popular choice for sports photography, but I chose it with the wildlife enthusiast in mind. At 70 ounces, you’ll want to make sure you’ve got a good monopod or tripod on hand. My impression is that it’s a great lens at an affordable price (for a superzoom). It does take a while to build technique, but then that’s typical of all big lenses. The main limitation is focusing in dim light. A few of the key features that caught my eye were the FLEX ZOOM lock, fast AF, and VC performance. The moisture-resistant build also gives you more confidence shooting in less-than-ideal weather. 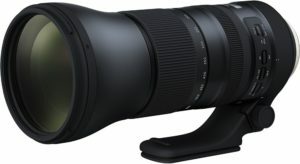 The Tamron F/5-6.3 SP 150-600mm is not the kind of lens entry-level users usually buy. Most experienced enthusiasts also sidestep it simply because of the price. That leaves prosumers and pros. It might be a niche market, but photographers are just as keen to leave their feedback. People usually know what to expect before they buy this beast. The reviews tend to reflect their initial expectations. Those who have used Nikon’s 200-500mm prefer the Tamron. They like it because it’s wider and has faster autofocus. Image sharpness and other quality issues get a big thumbs-up, too. This is a good lens for sports and wildlife photography. Most online feedback tends to come from wildlife enthusiasts—especially birders. There are plenty of photos uploaded by users, as well. The FLEX ZOOM LOCK is a new feature on the G2 lens. It’s a welcome mechanism that allows the user to lock and unlock the zoom ring at any position. This ultra-telephoto zoom has effective Vibration Compensation or VC to help keep images sharp. VC is invaluable when shooting fast moving and distant subjects. It’s essential for action and wildlife. The Ultrasonic Silent Drive (USD) adds further to the lens’ ability and performance. These things combined allow the photographer to concentrate on the subject while the lens takes care of itself. There’s a special fluorine coating on the lens’ front surface. Combined with moisture-resistance, this protection helps to safeguard the optics and makes it easier to clean the glass. Without the lock on the lens, it tends to creep. It’s only a problem until you get used to using the FLEX ZOOM LOCK. The autofocus slows down a tad at the longer focal lengths. The lens extends out while focusing. This can’t be helped, but photographers would sooner wish it didn’t move, given the choice. The apertures are slow at both the wide and telephoto ends, as well. At 70 oz. this beast is heavy, but again – it’s a big chunk of glass. The weight will only bother new users of this ultra-telephoto zoom until they get used to it. This beautiful piece of glass is not expensive for what it is. Alas, its price tag is still outside the grasp of most amateurs who’d loved to get their hands on it.